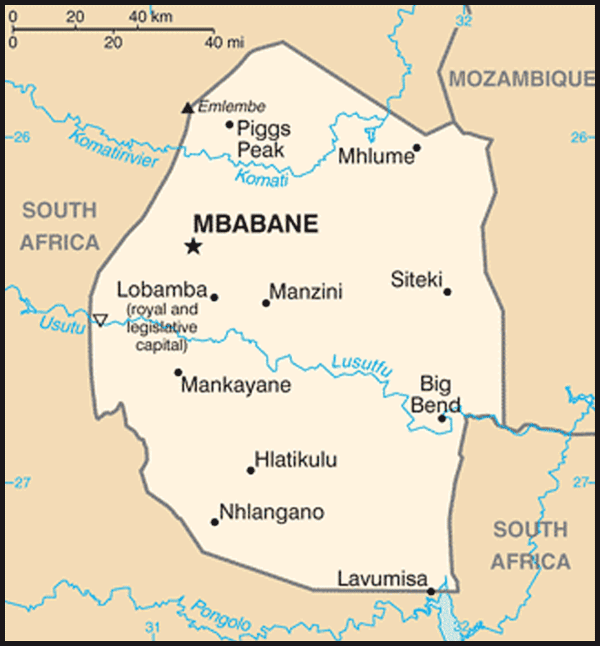 Major cities: Mbabane (capital, pop. 60,000), Manzini (principal commercial city, pop. 65,000). Nationality: Noun and adjective — Swazi(s). Population (July 2011 est. ): 1,370,424. Annual population growth rate (2011 est. ): 1.204%. Ethnic groups: African 97%, European 3%. Religion: Zionist 40%; Roman Catholic 20%; Muslim 2%; and other religious affiliations 38%, including Anglican, Baha'i, Methodist, The Church of Jesus Christ of Latter-day Saints (Mormon), and Jewish. Education: Years compulsory: none. Attendance — 65% primary and 44% secondary. Literacy — 81.6%. Health: Infant mortality rate (2011 est.) — 63.09/1,000. Life expectancy (2011 est.) — 48.66 years. The prevalence of HIV in Swaziland's adult population is estimated at 26%, the highest in the world. Work force: Agriculture and forestry: 21.4%; construction — 6.1%; distribution — 10.5%; finance — 8.3%; manufacturing — 20.1%; mining and quarry — 1%; services — 32.6%; transport — 2.9%. Constitution: On July 26, 2005, King Mswati III ratified Swaziland's constitution. This is Swaziland's first constitution in over 30 years. It went into effect February 8, 2006. Branches: Executive: monarch (head of state), prime minister (head of government — appointed by the king at the recommendation of the Swazi National Council (SNC), cabinet (appointed by the king at the recommendation of the prime minister). Legislative — Parliament consisting of the House of Assembly (65 members: 55 elected, 10 appointed by the king) and Senate (30 members: 10 appointed by the House of Assembly, 20 appointed by the king). Judicial — a dual court system of traditional courts under chiefs and a Roman-Dutch system comprising magistrates courts, High Court, Supreme Court (formerly Court of Appeals). Administrative subdivisions: 4 regions, 11 municipal governments, and 55 tinkhundla centers (traditional administrative units). GDP (2010 est. ): $6.067 billion. GDP real growth rate: 2.4% (2008); 0.4% (2009); 2.0% (2010). Gross national income per capita (2010): $4,500. Inflation: 12.6% (2008); 7.5% (2009); 5% (2010). Natural resources: Coal, quarry stone, timber, talc. Agriculture (8.3% of GDP): Products: sugarcane, corn, citrus fruits, livestock, wood, pineapple, tobacco, rice, peanuts. Manufacturing (28.2% of GDP): Types: sugar refining, light manufactured goods, wood pulp, textiles, processed foods, consumer goods. Trade (2010): Exports: $1.417 billion: soft drink concentrates, sugar, pulp, canned fruits, cotton yarn. Major markets — South Africa (80%), EU (10%), Mozambique (10%). Imports — $1.643 billion: chemicals, clothing, foodstuffs, machinery, motor vehicles, petroleum products. The majority of the population is ethnic Swazi, mixed with a small number of Zulus and non-Africans. Traditionally Swazis have been subsistence farmers and herders, but some now work in the growing urban formal economy and in government. Some Swazis work in the mines in South Africa. Christianity in Swaziland is sometimes mixed with traditional beliefs and practices. Most Swazis ascribe a special spiritual role to the monarch. The country's official languages are SiSwati (a language related to Zulu) and English. Government and commercial business is conducted mainly in English. According to tradition, the people of the present Swazi nation migrated south before the 16th century from what is now Mozambique. Following a series of conflicts with people living in the area of modern Maputo, the Swazis settled in northern Zululand in about 1750. Unable to match the growing Zulu strength, the Swazis moved gradually northward in the 1800s and established themselves in the area of modern or present Swaziland. They consolidated their hold under several able leaders. The most important was Mswati II, from whom the Swazis derive their name. Under his leadership in the 1840s, the Swazis expanded their territory to the northwest and stabilized the southern frontier with the Zulus. Contact with the British came early in Mswati's reign, when he asked British authorities in South Africa for assistance against Zulu raids into Swaziland. It also was during Mswati's reign that the first whites settled in the country. Following Mswati's death, the Swazis reached agreements with British and South African authorities over a range of issues, including independence, claims on resources by Europeans, administrative authority, and security. South Africans administered the Swazi interests from 1894 to 1902. In 1902 the British assumed control. In 1921, after more than 20 years of rule by Queen Regent Lobatsibeni, Sobhuza II became Ngwenyama (lion) or head of the Swazi nation. The same year, Swaziland established its first legislative body — an advisory council of elected European representatives mandated to advise the British high commissioner on non-Swazi affairs. In 1944, the high commissioner conceded that the council had no official status and recognized the paramount chief, or king, as the native authority for the territory to issue legally enforceable orders to the Swazis. In the early years of colonial rule, the British had expected that Swaziland would eventually be incorporated into South Africa. After World War II, however, South Africa's intensification of racial discrimination induced the United Kingdom to prepare Swaziland for independence. Political activity intensified in the early 1960s. Several political parties were formed and jostled for independence and economic development. The largely urban parties had few ties to the rural areas, where the majority of Swazis lived. The traditional Swazi leaders, including King Sobhuza II and his Inner Council, formed the Imbokodvo National Movement (INM), a political group that capitalized on its close identification with the Swazi way of life. Responding to pressure for political change, the colonial government scheduled an election in mid-1964 for the first legislative council in which the Swazis would participate. In the election, the INM and four other parties, most having more radical platforms, competed in the election. The INM won all 24 elective seats. Having solidified its political base, INM incorporated many demands of the more radical parties, especially that of immediate independence. In 1966, the U.K. Government agreed to discuss a new constitution. A constitutional committee agreed on a constitutional monarchy for Swaziland, with self-government to follow parliamentary elections in 1967. Swaziland became independent on September 6, 1968. 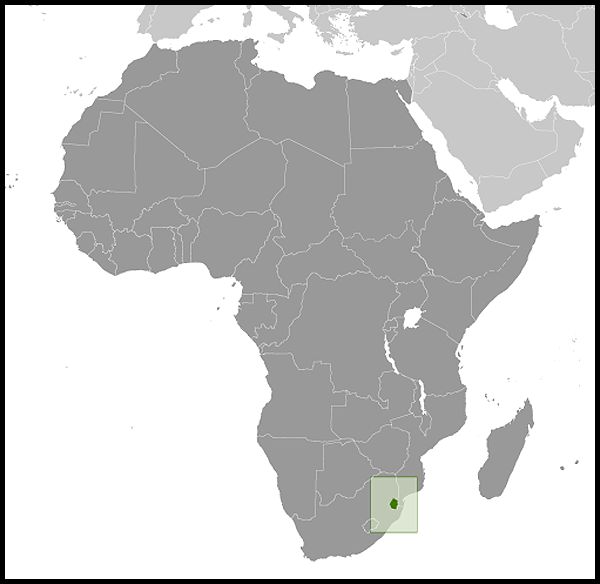 Swaziland's post-independence elections were held in May 1972. The INM received close to 75% of the vote. The Ngwane National Liberatory Congress (NNLC) received slightly more than 20% of the vote, which gained the party three seats in parliament. In response to the NNLC's showing, King Sobhuza repealed the 1968 constitution on April 12, 1973 and dissolved parliament. He assumed all powers of government and prohibited all political activities and trade unions from operating. He justified his actions as having removed alien and divisive political practices incompatible with the Swazi way of life. In January 1979, a new parliament was convened, chosen partly through indirect elections and partly through direct appointment by the King. King Sobhuza II died in August 1982, and Queen Regent Dzeliwe assumed the duties of the head of state. In 1984, an internal dispute led to the replacement of the Prime Minister and eventual replacement of Dzeliwe by a new Queen Regent Ntombi. Ntombi's only child, Prince Makhosetive, was named heir to the Swazi throne. Real power at this time was concentrated in the Liqoqo, a supreme traditional advisory body that claimed to give binding advice to the Queen Regent. In October 1985, Queen Regent Ntombi demonstrated her power by dismissing the leading figures of the Liqoqo. Prince Makhosetive returned from school in England to ascend to the throne and help end the continuing internal disputes. He was enthroned as Mswati III on April 25, 1986. Shortly afterwards he abolished the Liqoqo. In November 1987, a new parliament was elected and a new cabinet appointed. In 1988 and 1989, an underground political party, the People's United Democratic Movement (PUDEMO) criticized the King and his government, calling for democratic reforms. In response to this political threat and to growing popular calls for greater accountability within government, the King and the Prime Minister initiated an ongoing national debate on the constitutional and political future of Swaziland. This debate produced a handful of political reforms, approved by the King, including direct and indirect voting in the 1993 national elections. On July 26, 2005 King Mswati III ratified Swaziland's first constitution in over 30 years. It went into effect February 8, 2006; a 1973 proclamation that had banned political parties lapsed at that time. While the current constitution does not prohibit the existence of political parties, parties are not allowed to contest elections. According to Swazi law and custom, the monarch holds supreme executive, legislative, and judicial powers. In practice, however, the monarch's power is delegated through a dualistic system — modern, statutory bodies like the cabinet, and the traditional governing structures of the tinkhundla system. The king must approve legislation passed by parliament before it becomes law. The prime minister, who is head of government, and the cabinet, which is recommended by the prime minister and approved by the king, exercise executive authority. At present, parliament consists of a 65-seat House of Assembly (55 members are elected through popular vote; 10 are appointed by the king) and 30-seat Senate (10 members are appointed by the House of Assembly, and 20 are appointed by the king). House of Assembly elections were last held on September 19, 2008. For local administration Swaziland is divided into four regions, each with an administrator appointed by the king. Parallel to the government structure is the traditional system consisting of the king and his advisers, traditional courts, 55 tinkhundla (sub-regional districts in which traditional chiefs are grouped), and approximately 360 chiefdoms. Swaziland maintains an embassy in the United States at 1712 New Hampshire Avenue, NW, Washington, DC 20009 (tel: 202-234-5002; fax: 202-234-8254). Swaziland's UN Mission is located at 408 East 50th Street, New York, NY 10022 (tel: 212-371-8910; fax: 212-754-2755). Swaziland ranks as a lower middle income country, but it is estimated that 69% of the population lives in poverty. Most of the high-level economic activity is in the hands of non-Africans, but ethnic Swazis are becoming more active. Small entrepreneurs are moving into middle management positions. Although more than 70% of Swazis live in rural areas, nearly every homestead has a wage earner. The past several years have seen wavering economic growth as the small economy is strongly affected by climactic conditions and external factors. In 2010, the kingdom plunged into a fiscal crisis after alterations in the Southern African Customs Union revenue-sharing formula, the receipts from which accounted for more than half of the country's fiscal revenue. Coupled with mismanagement of public funds and overspending, the decline in SACU receipts led to a near-collapse of public finances and caused the government to draw down its foreign-exchange reserves and to seek external financing. Nearly 60% of Swazi territory is held by the Crown in trust of the Swazi nation. The balance is privately owned, much of it by foreigners. The question of land use and ownership remains a very sensitive one. For Swazis living on rural homesteads, the principal occupation is either subsistence farming or livestock herding. Culturally, cattle are important symbols of wealth and status, but they are being used increasingly for milk, meat, and profit. Overgrazing, soil depletion, drought, and floods are persistent problems. Swaziland enjoys well-developed road links with South Africa. It also has railroads running east to west and north to south. The older east-west link, called the Goba line, makes it possible to export bulk goods from Swaziland through the Port of Maputo in Mozambique. Most of Swaziland's imports were shipped through this port. Conflict in Mozambique in the 1980s diverted many Swazi exports to ports in South Africa. Swaziland mainly uses the port today for exports of sugar, citrus, and forest products, with future usage of the port expected to increase. A north-south rail link, completed in 1986, provides a connection between the Eastern Transvaal rail network and the South African ports of Richard's Bay and Durban. The sugar industry, based solely on irrigated cane, is Swaziland's leading export earner and private-sector employer. Soft drink concentrate (a U.S. investment) is another large export earner, followed by wood pulp and lumber from cultivated pine forests. Pineapple and citrus fruit are other important agricultural exports. Swaziland mines coal and diamonds for export. There also is a quarry industry for domestic consumption. In 2010, mining contributed about 1.8% of Swaziland's GDP, and predictions for the industry are mixed as coal mining is expected to increase but quarried stone production is expected to decrease. A number of industrial firms have located at the industrial estate at Matsapha near Manzini. In addition to processed agricultural and forestry products, the industrial sector at Matsapha also produces garments, textiles, and a variety of light manufactured products. The Swaziland Industrial Development Company (SIDC) and the Swaziland Investment Promotion Authority (SIPA) have assisted in bringing many of these industries to the country. Government programs encourage Swazi entrepreneurs to run small and medium-sized firms. Tourism also is important, attracting more than 450,000 visitors annually, mostly from Europe and South Africa. From the mid-1980s, foreign investment in the manufacturing sector boosted economic growth rates significantly. Beginning in mid-1985, the depreciated value of the currency increased the competitiveness of Swazi exports and moderated the growth of imports, generating trade surpluses. During the 1990s, the country often ran small trade deficits. South Africa and the European Union are major customers for Swazi exports. Swaziland became eligible for the African Growth and Opportunity Act (AGOA) in 2000 and qualified for the apparel provision in 2001. AGOA created over 30,000 jobs, mostly for women, in Swaziland's apparel industry. However, the industry suffered in 2005-2006, due to both increased global competition as a result of the end of the Agreement on Textiles and Clothing (ATC) on January 1, 2005, and the strong Rand (Swaziland's currency is linked to the South African Rand at par), which reduced exports. There are an estimated 16,000 people employed in the apparel industry. Swaziland, Lesotho, Botswana, Namibia, and the Republic of South Africa form the Southern African Customs Union, where import duties apply uniformly to member countries. Swaziland, Lesotho, Namibia, and South Africa also are members of the Common Monetary Area (CMA) in which repatriation and unrestricted funds are permitted. Swaziland issues its own currency, the lilangeni (plural: emalangeni). Swaziland is a member of the United Nations; the African Union; the Common Market for Eastern and Southern Africa (COMESA), which it currently chairs; and the Southern African Development Community (SADC). Ten accredited ambassadors or honorary consuls are resident in the country. Swaziland maintains diplomatic missions in Brussels, Copenhagen, Kuala Lumpur, London, Maputo, Nairobi, Pretoria, Taipei, the United Nations, and Washington. The United States seeks to maintain and strengthen the good bilateral relations that have existed since the kingdom became independent in 1968. U.S. policy stresses continued economic and political reform and improved industrial relations. The United States assists Swaziland with a number of HIV/AIDS initiatives and programs implemented through the U.S. Agency for International Development (USAID), Health and Human Services/Centers for Disease Control (HHS/CDC), the Peace Corps, African Development Foundation, the Department of Labor, and the Department of Defense (DoD). In June 2009, the U.S. and Swaziland finalized a Partnership Framework Agreement under the President's Emergency Plan for AIDS Relief (PEPFAR). U.S. HIV/AIDS assistance to Swaziland is now approximately $38 million. On April 12, 2010 an additional $15 million was authorized for the Accelerated Saturation Initiative for Male Circumcision, with the funds to be divided amongst the three U.S. Government agencies partnering under the PEPFAR framework in Swaziland: USAID ($9.25 million), HHS/CDC ($5 million), and DoD ($750,000). The U.S. is also the largest bilateral donor to the Global Fund, Swaziland's principal HIV/AIDS funding source. In addition, the U.S. supports small-enterprise development, education, security sector capacity building, institutional and human resources development, agricultural development, and trade capacity building. The U.S. Government brings about six Swazi professionals to the United States each year, from both the public and private sectors, primarily for master's degrees, and about six others for 3-week to 4-week International Visitor programs. Through the security assistance program, the U.S. brings approximately 25 members of the Swazi security forces to the United States for education and training purposes. The United States also supports Swazi participation in regionally-based training and capacity-building programs, such as at the International Law Enforcement Academy (ILEA) in Gaborone, Botswana. In 2003, Peace Corps volunteers returned to Swaziland after a 9-year absence. In June 2009, the U.S. and Swaziland finalized a memorandum of understanding (MOU) expanding the duties of the Peace Corps mission in Swaziland. The Peace Corps/Swaziland program, known as the Community Health Project, focuses on HIV/AIDS and provides assistance in the execution of two components of the HIV/AIDS national strategy — risk reduction and mitigation of the impact of the disease. Volunteers encourage youth to engage in appropriate behaviors that will reduce the spread of HIV; they work with children orphaned by the HIV/AIDS pandemic; and they assist in capacity building for non-governmental organizations and community based organizations. In 2011, Peace Corps launched a new education project at the request of King Mswati III. Working in conjunction with the Ministry of Education, volunteers focus on a variety of capacity-building initiatives, including computer-skills training, life-skills support, teacher training, and TEFL (teaching English as a foreign language). Volunteers work in areas across the country, living in homesteads with host families, learning SiSwati, and studying cross-cultural practices. The U.S. Embassy (http://swaziland.usembassy.gov/) in Swaziland is situated in the Central Bank of Swaziland building in the Mbabane city center. The address is American Embassy, 7th floor Central Bank Building, Mahlokohla St., Box 199, Mbabane, Swaziland (tel. 268-2404-6441/6445; fax 268-2404-1695).